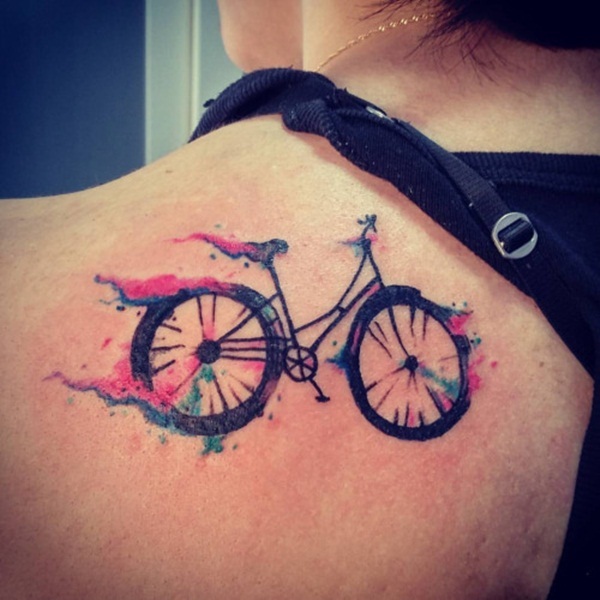 If you are looking for a new tattoo design and you want something truly extraordinary then look no further than the watercolor tattoos. They are truly stunning and the newest trend out there for different tattoos. 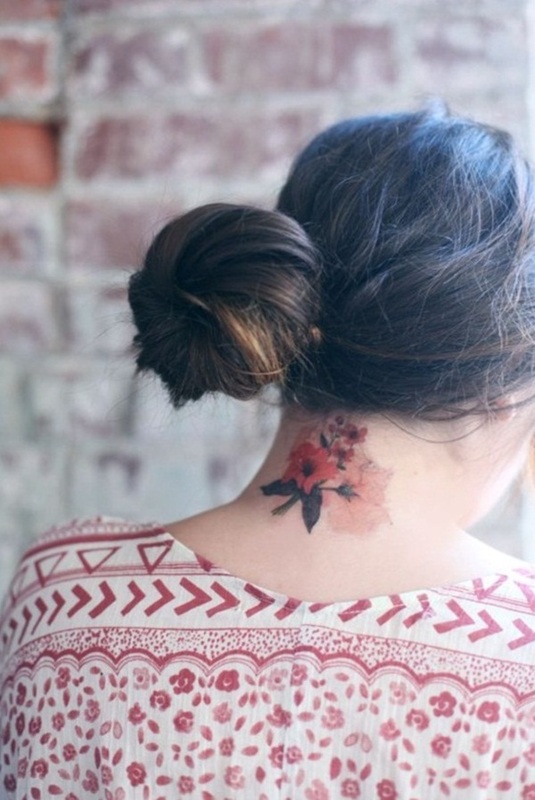 There is just something so breathtaking about the watercolor tattoo. It looks just like a watercolor painting. You can have any design you want, splashed on your skin in the most amazing way. 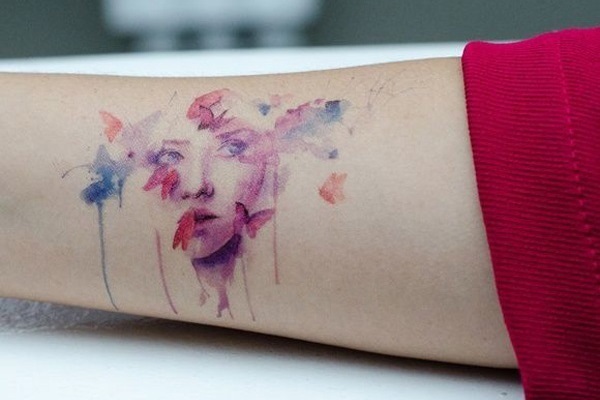 It seems that every day there is a new way of tattoo designs onto your skin and when they came up with the watercolor design they really hit a creative and wonderful idea. 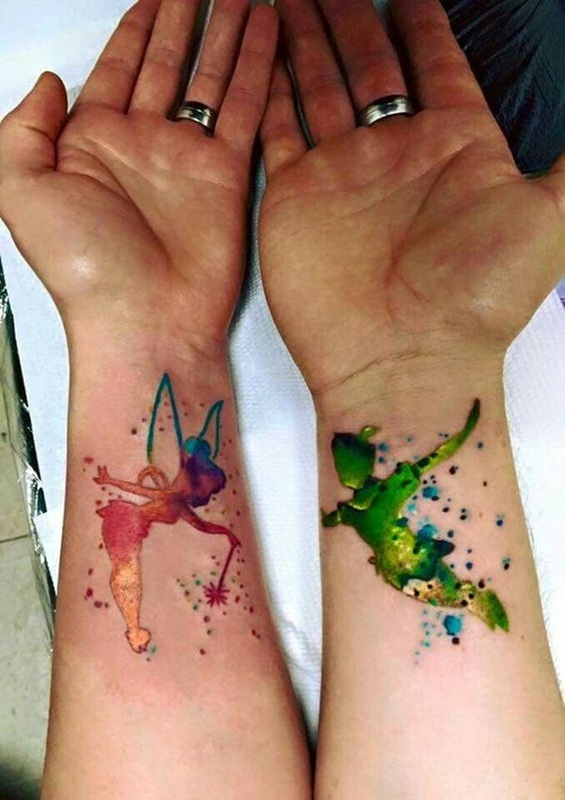 Tattoo art has reached a whole new level, and we are seeing things that our grandparents never knew existed. 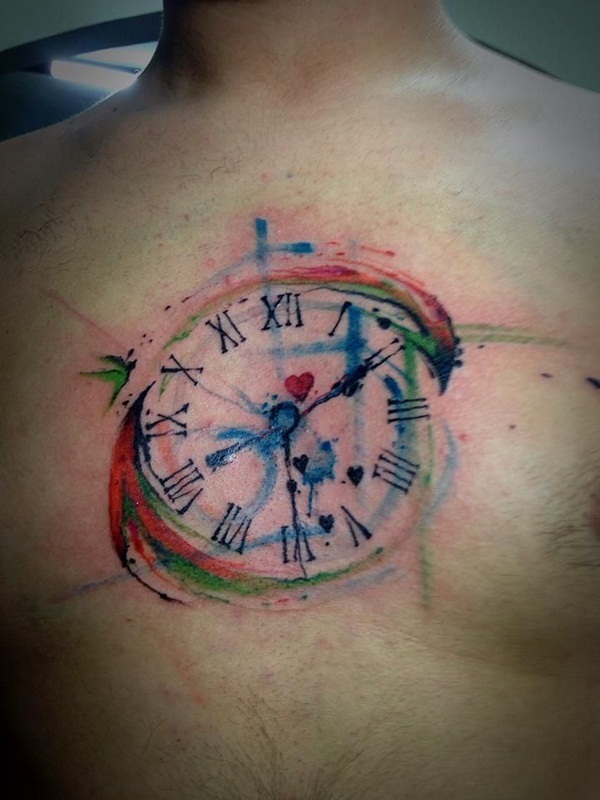 Gone are the standard, cheap tattoos and in walks something that can only be described as art. 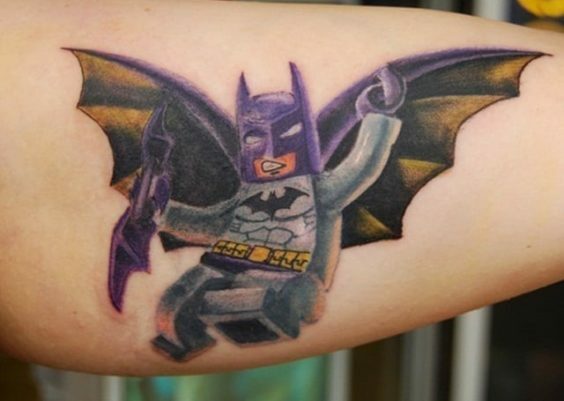 Tattoo artists are having a ball these days with the new creations coming out of their shops. These new ideas are of course inspired by watercolor paintings, and they are just stunning in design. They are a great way to express your love, your beliefs, and even your emotions. It’s the best tattoo idea available for anyone that wants a new tattoo idea. The water color designs have won the hearts of many, and they are only growing in popularity. 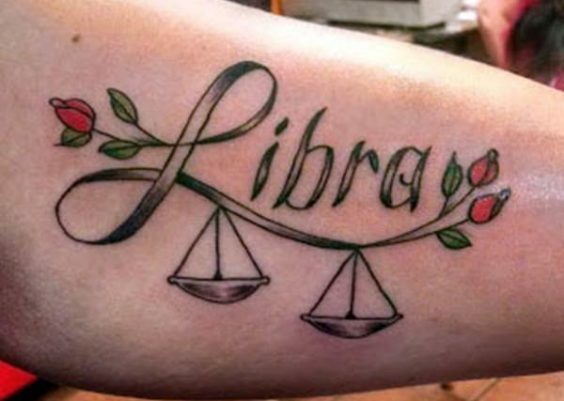 It’s certainly a great way to impress your friends and make them jealous of your new tattoo. 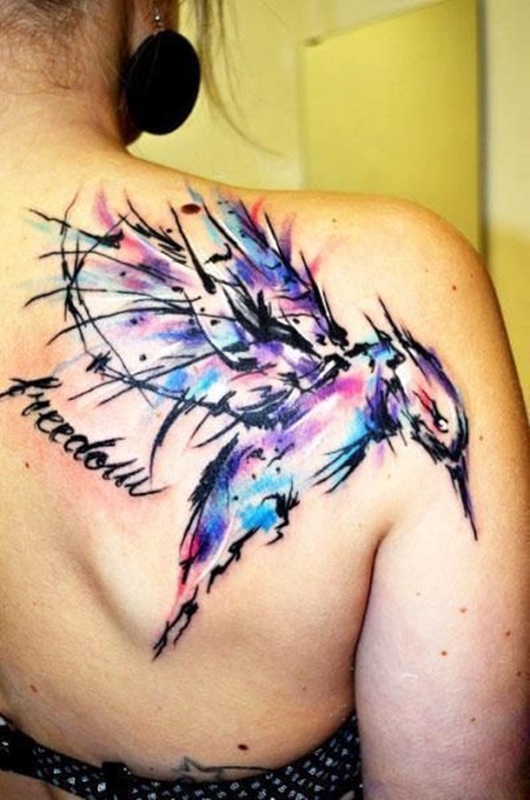 The sky is the limit for tattoo ideas, you can get just about anything as a watercolor tattoo. There are elephants, flowers, feather, owl, quotes, roses, trees, sunflowers, magnolia, lions, mermaids, butterflies, dandelions, fish and so much more. 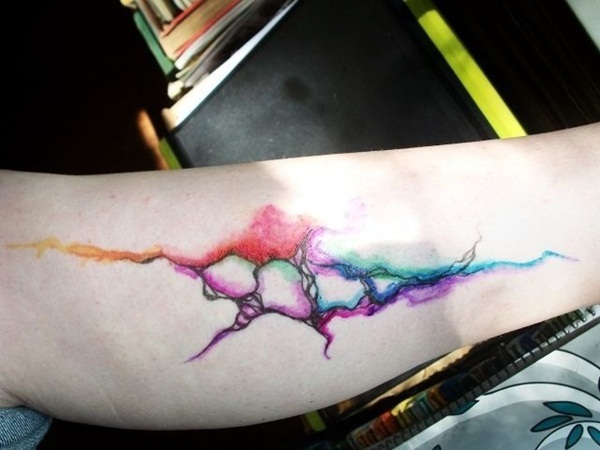 Just about anything looks great as a watercolor tattoo design. The technique behind the water color design is truly cool. They almost look like crayon designs they are that spectacular. 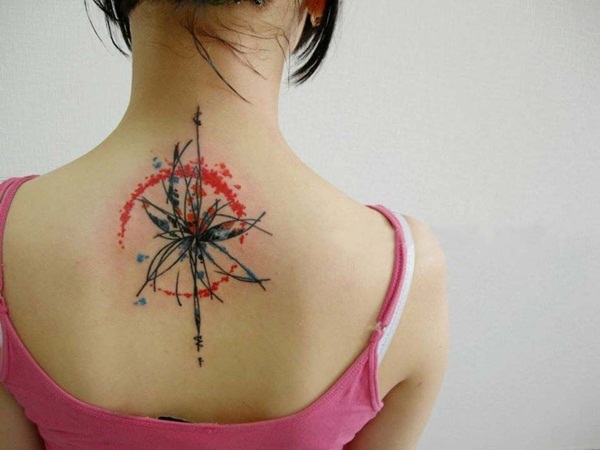 It’s easy to get tattoo ideas; the web is a great place for them. We have many ideas in our own article that make for wonderful designs. A stunning and random design that you are sure to love. 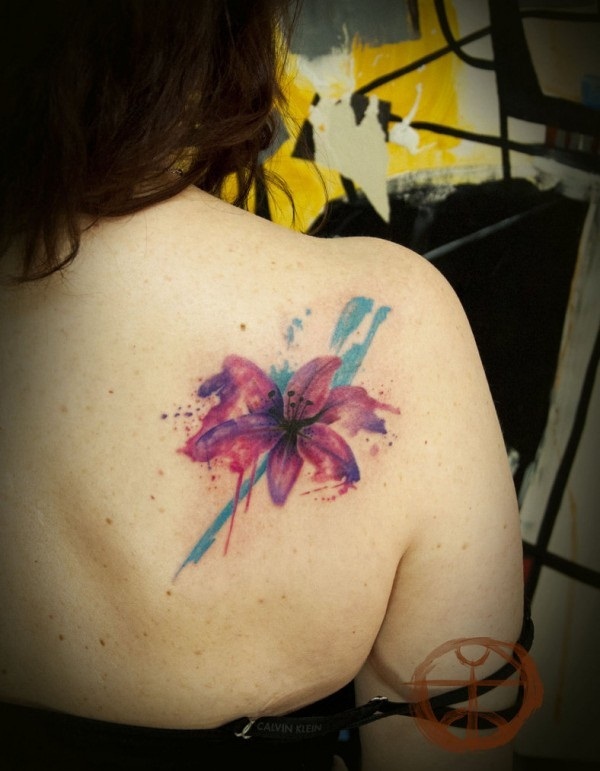 The splashes of color in the back are what really make the tattoo. A stunning design in purple and blue that you are sure to love. If you love the geometric designs, then you are sure to love this one. It trailed down the spine, and the paint drips are so cool. 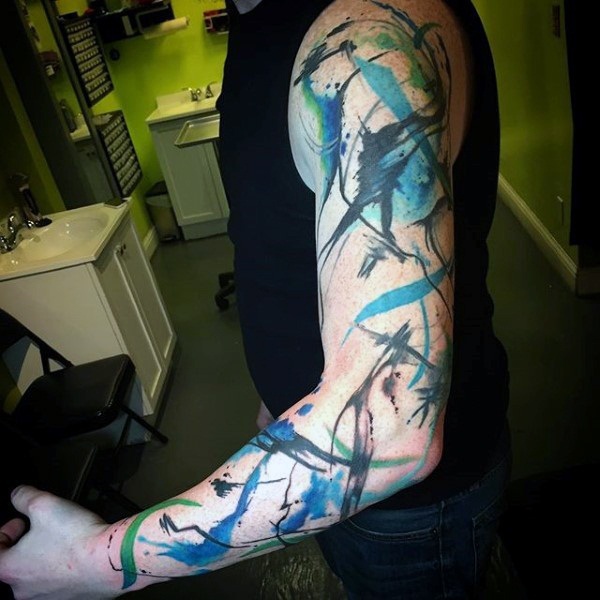 This sleeve tattoo looks like an abstract painting where there are many watercolors splashes all the way down the arm. 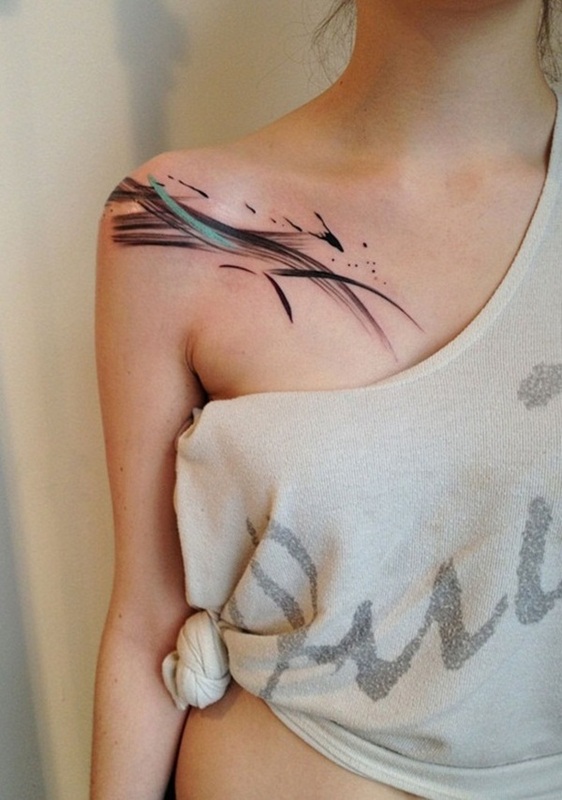 I love the brush stroke look that is involved in this tattoo; it is definitely one cool looking tattoo. These geometric designs look awesome with the paint splashes behind them. One arm is a circular tattoo design while the other is a bunch of triangles. These designs are really cool looking for a new tattoo look. 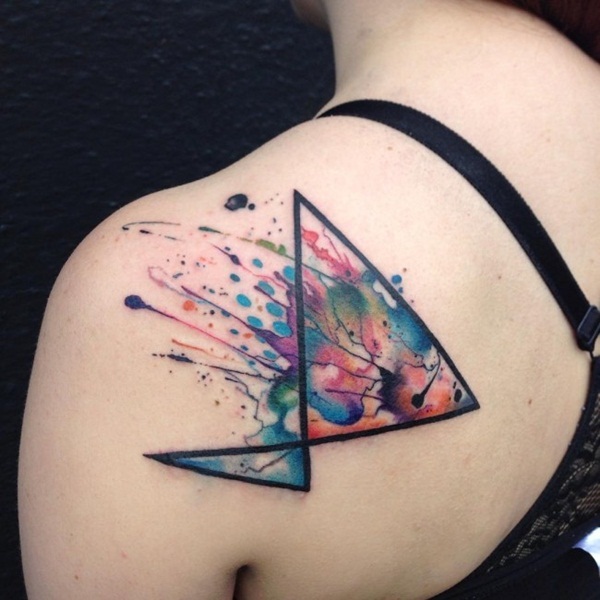 Watercolor tattoos are great with geometric symbols because they really look cool together. The bright colors here really make for a great tattoo. 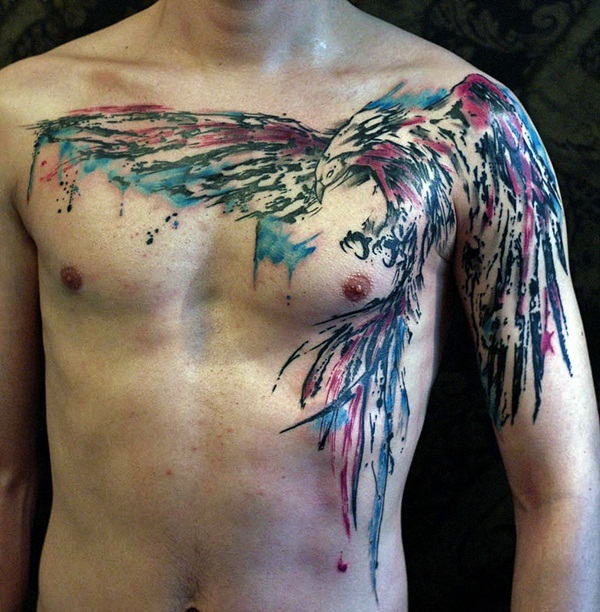 I love the look of a great tattoo design with paint splashes all over the place. The colors are bright and beautiful. 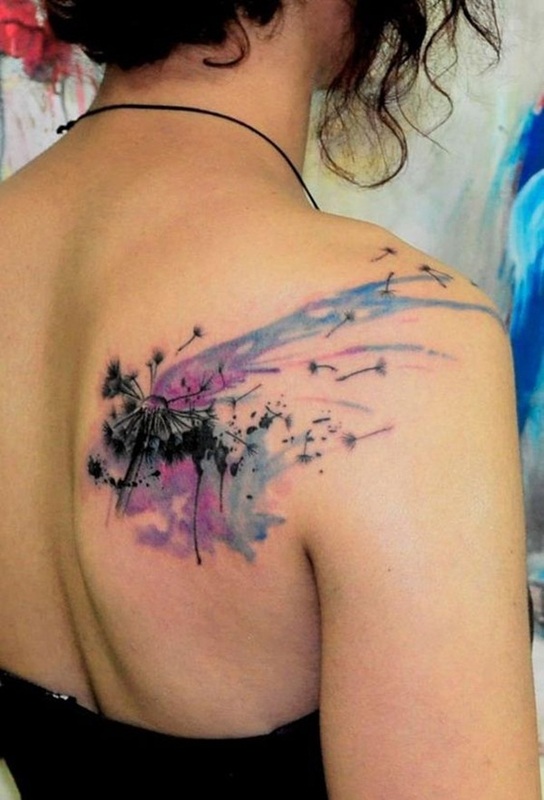 Talk about an amazing tattoo design, it’s so beautiful, and the soft pastel colors really make the tattoo breathtaking. 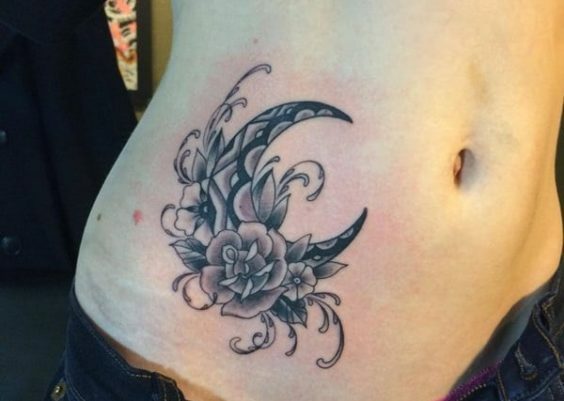 It’s not a large tattoo design, and this one is a stunning one indeed. 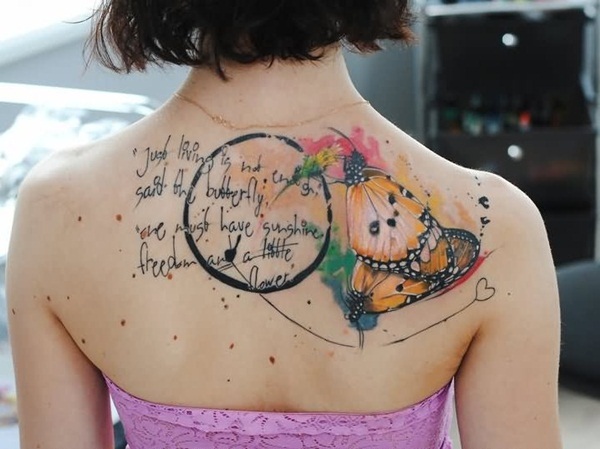 Butterflies all over the place that make the tattoo so pretty. 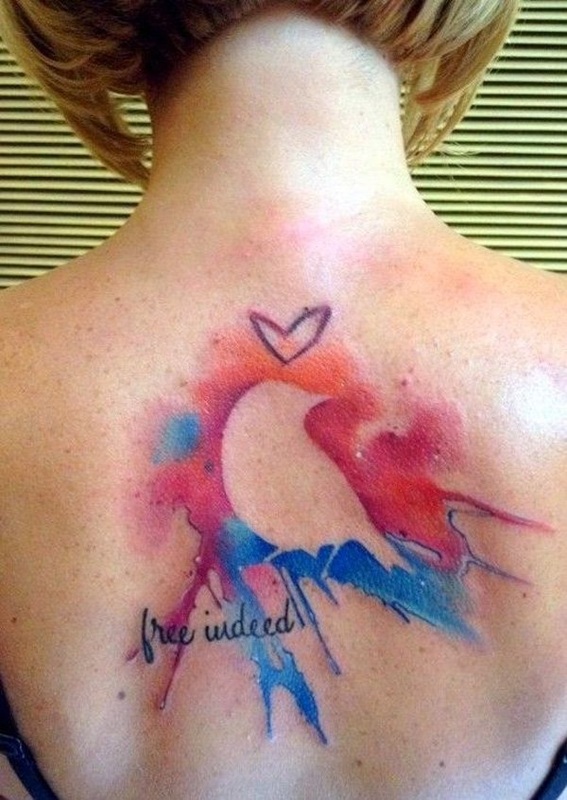 If you have a love for sea creatures, then you are sure to love this bright tattoo design. 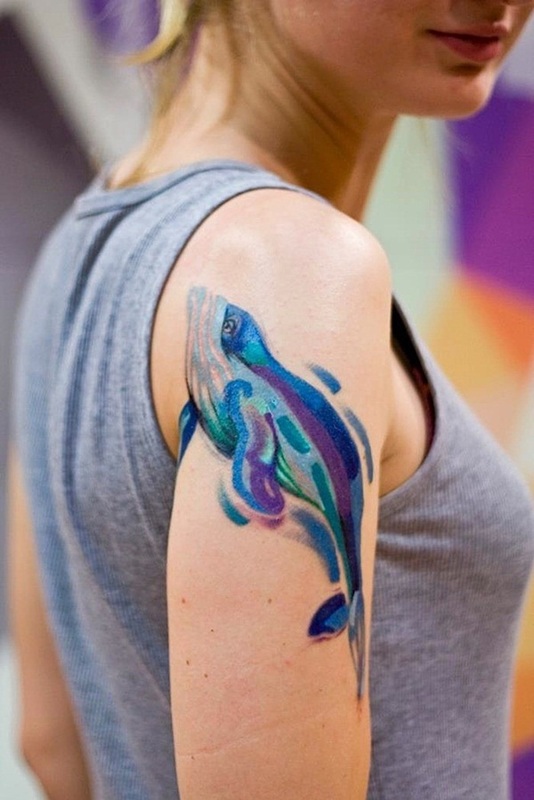 I just love the color combinations involved in this whale tattoo. 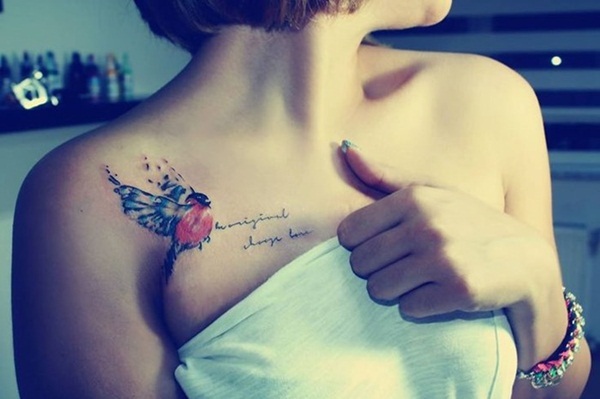 It’s a great tattoo that is truly beautiful. A stunning owl design that is great for someone looking for a large design. The brush stroke look to this design is stunning. The colors are great together when they are up against the black. The contrast is rather striking. A delicate design that has some great colors to it. The colors are light, and they really work out well together. 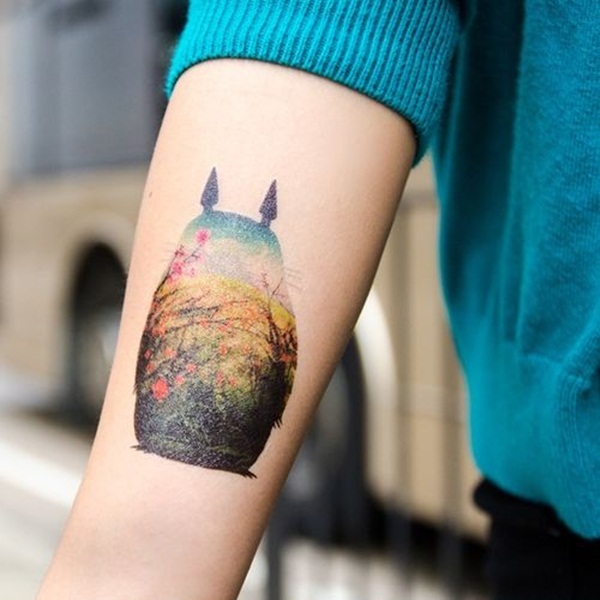 A sweet tattoo that looks awesome. 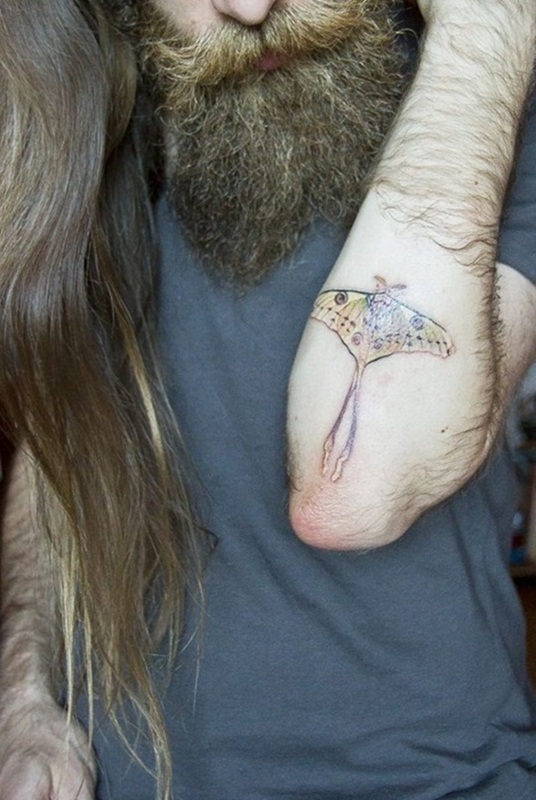 Even moths can look great as a sweet design without being feminine for a man. We love it. A great floral design that compliments the back of the neck. 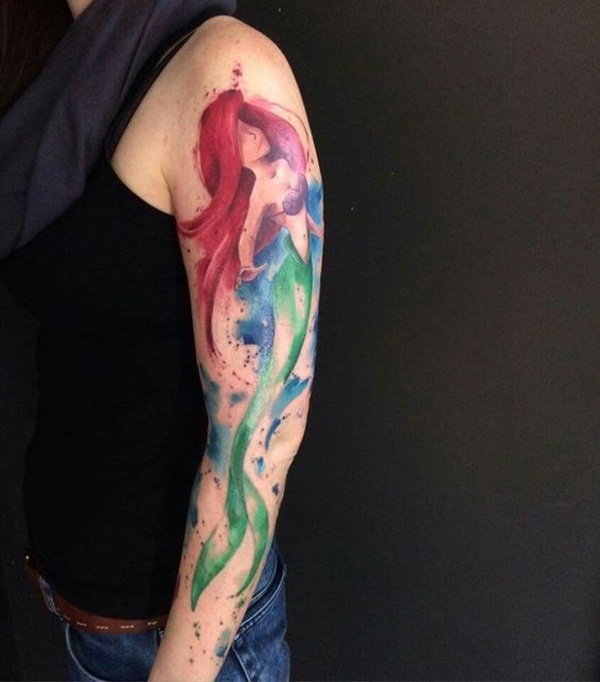 The colors are the best part of the tattoo. I love these brush strokes they look amazing a long the shoulder blade. Add a touch of green to give it pop. This flower design has a vintage appeal to it. A stunning look that resembles a painting. If you are a fan of these dreamers, then this is a great tattoo. I love the metallic coloring of the tattoos,m they are truly amazing. Who doesn’t love the Little Mermaid? This sleeve tattoo design is truly inspiring. 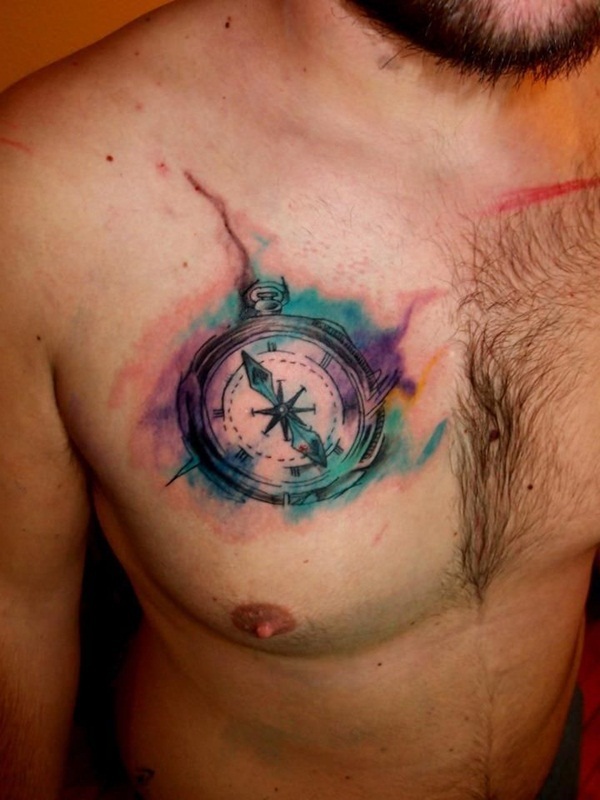 A great design for the ribcage and you can see the splashes of watercolor in the background. 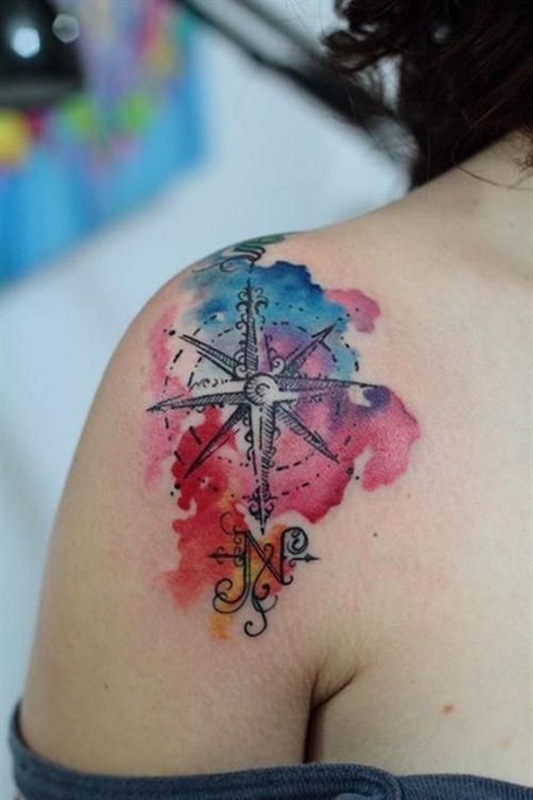 A stunning nautical design that has some incredible colors with it. 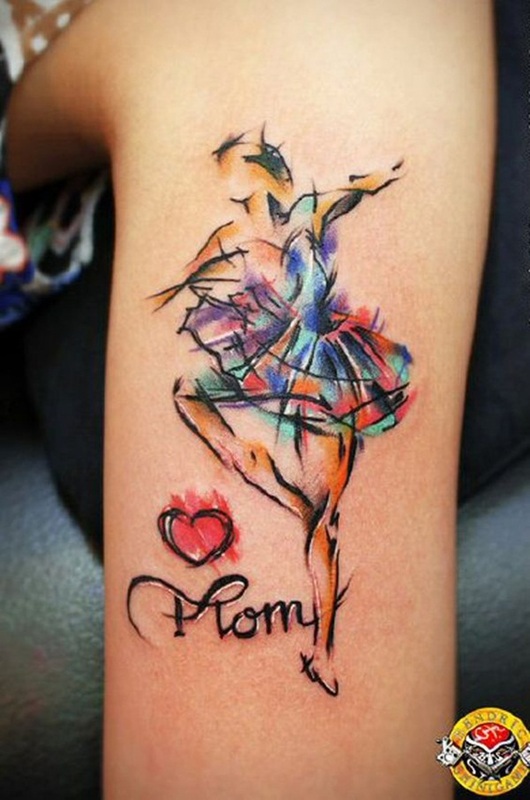 This ballerina is a stunning creation with some beautiful colors. There is an inscription to “Mom” at the bottom that is inspiring. You can make any tattoo personal to yourself. 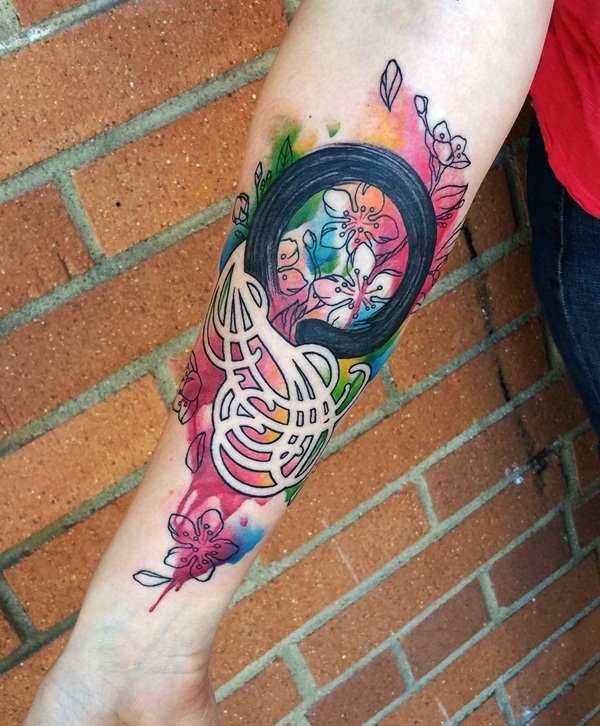 A great tattoo design that is amazing because of its scratchy technique and the bright, beautiful colors that are involved. You don’t get better designs than this. It’s breathtaking. 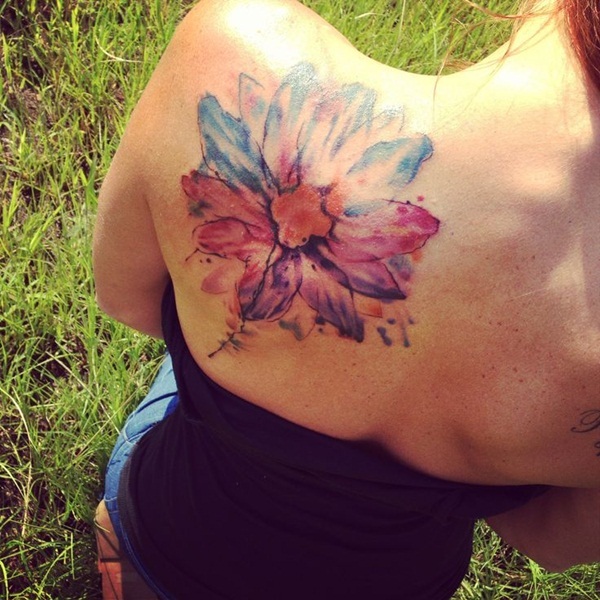 A stunning dandelion tattoo with some beautiful colors. I love how the dandelion fluff is flying up and over her shoulder. 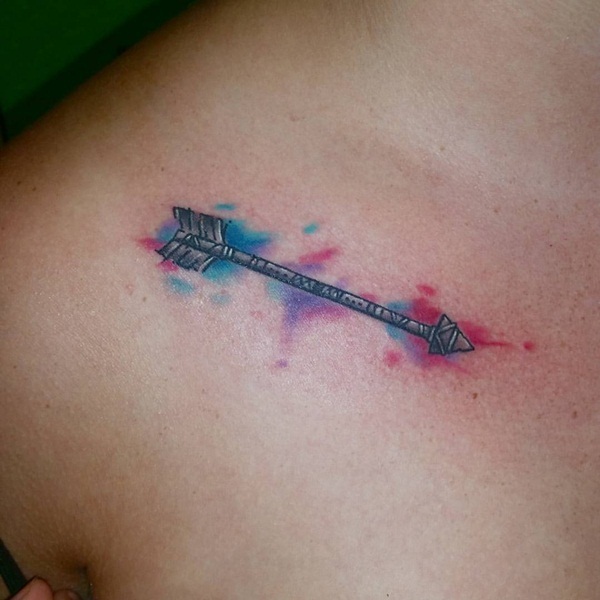 The arrow tattoo is a popular design choice and one that you are sure to love as well. 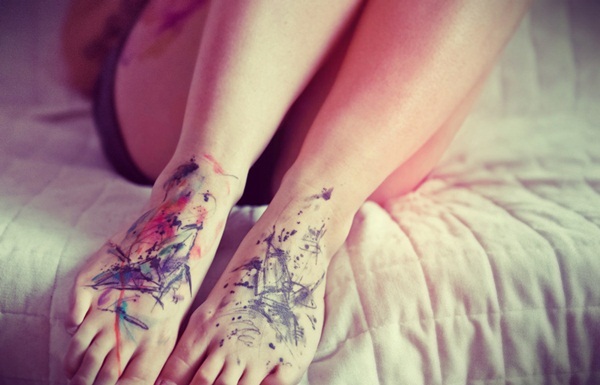 These abstract tattoos cover both feet creating some extraordinary designs. This tree of life has some stunning branches reaching out towards the shoulder looking great with all the beautiful colors. 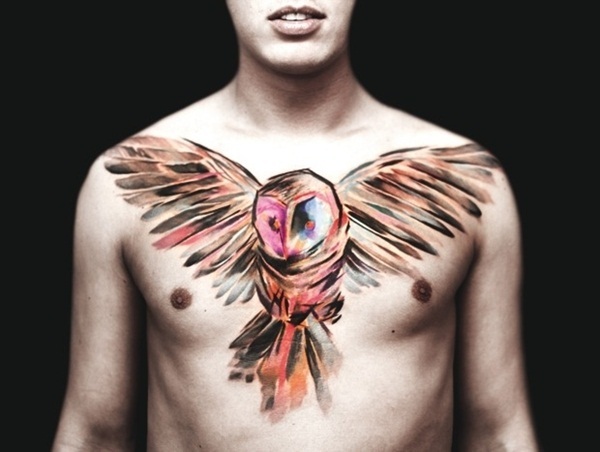 Now, this is an image that looks very cool as a watercolor tattoo design. The quote to the side completes the look. 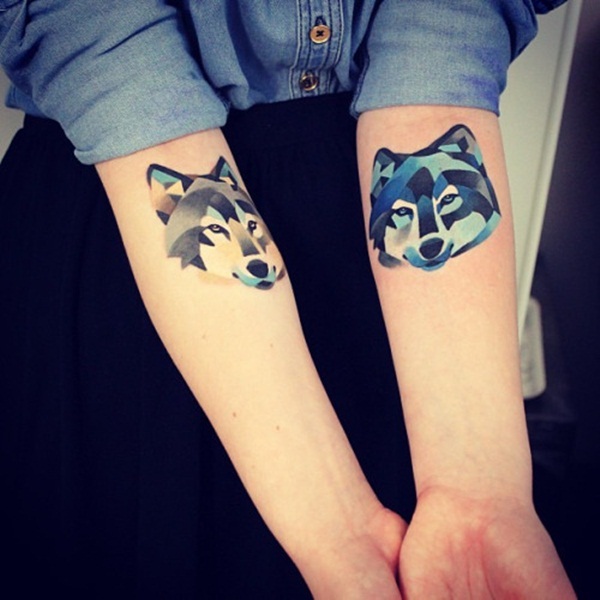 A cool watercolor tattoo design that has wolves on each arm. 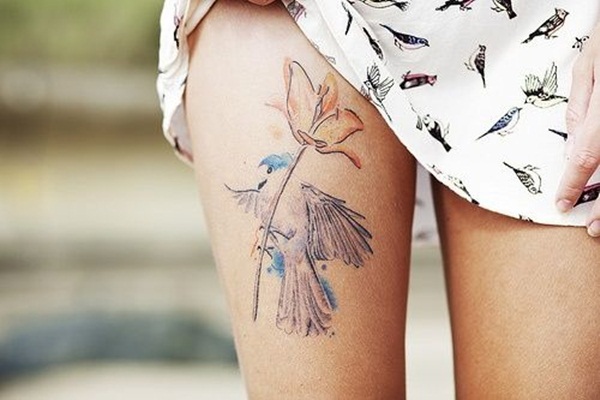 A great leg tattoo that has some beautiful flowers in unique colors. Is it an image of an alien, I’m not sure, but I love the landscape design on the inside. It’s very beautiful with the bright colors. A large floral design that has some bold and bright colors. A great and unique design indeed. 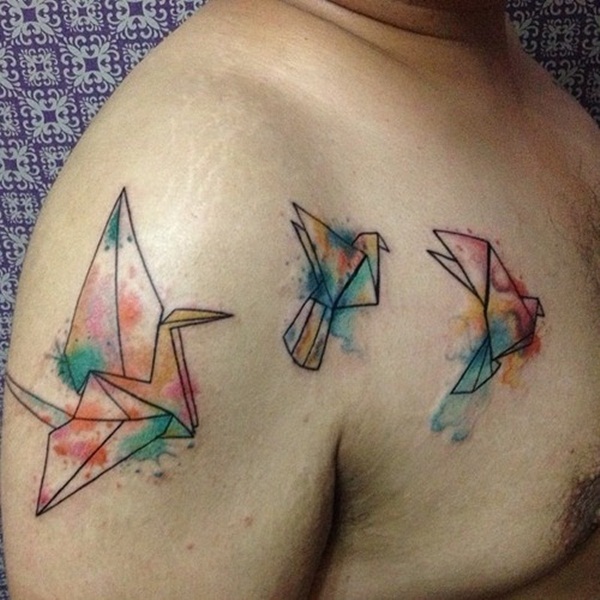 A great design that includes three origami birds with bright colors. A great chandelier design that is stunning with the elegant beads that are dropping. The watercolors are bright in pinks and blues. A great image of the pumpkin king that if you are a big fan. His head holds a scene from the movie one that is important to the theme. 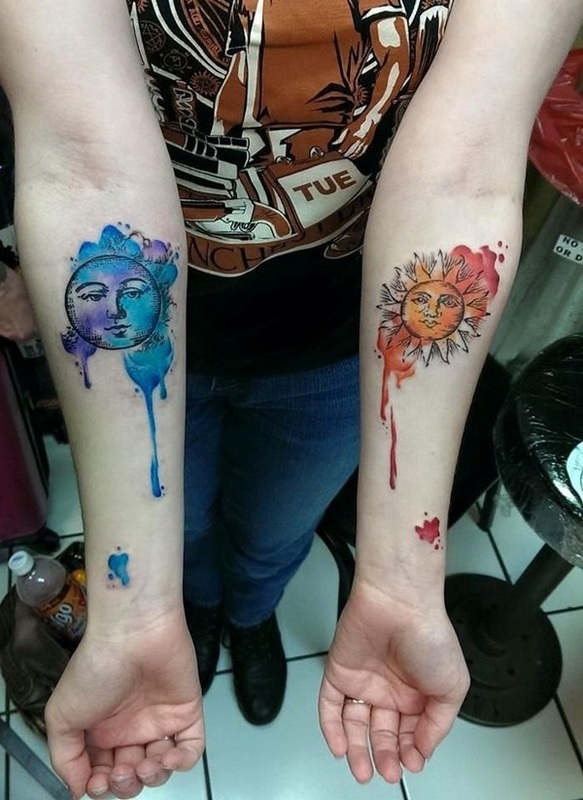 The celestial sun and the moon are symbolic tattoos that you are sure to love. 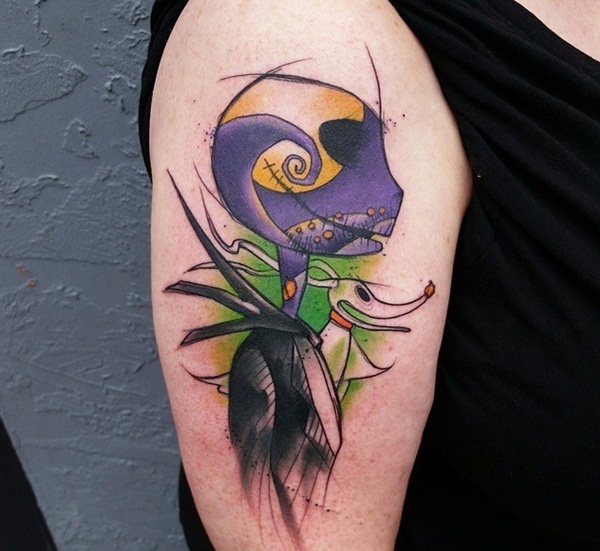 The colors involved in the tattoo are truly unique. Talk about a cool looking tattoo design. The colors just make it even more amazing. 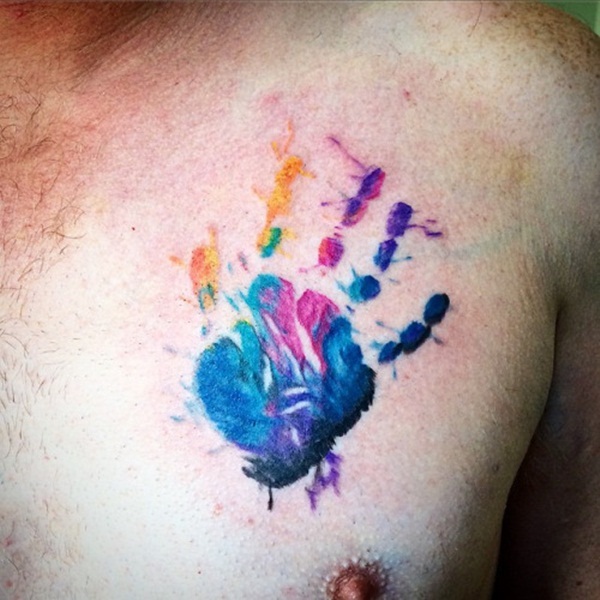 A stunning colorful handprint. It could be of your child or someone else that you want to honor. 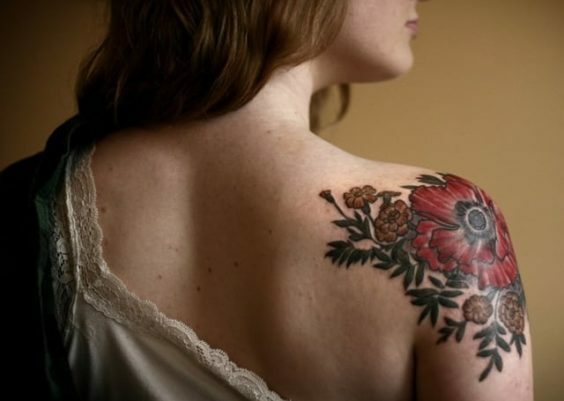 A great vintage design of a floral tattoo. If you like the classic look, then you are sure to love this one. A great circular image that creates a clock through paint strokes. It’s a unique design that you are sure to love. A colorful bike that looks like it’s on the move. The wind around the bike is portrayed through the bright colors. 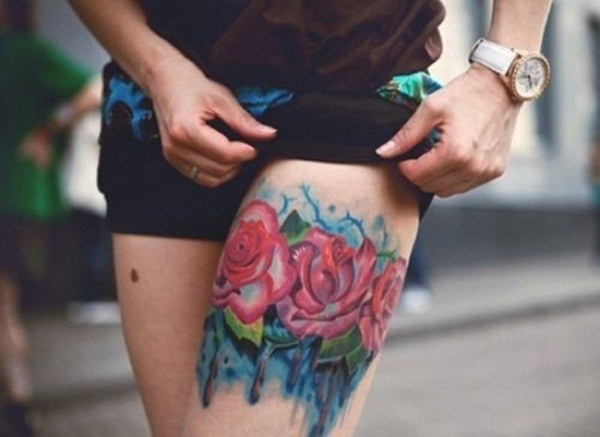 A great floral design that makes a great leg tattoo. The colors are beautiful, and I love the look of dripping paint. 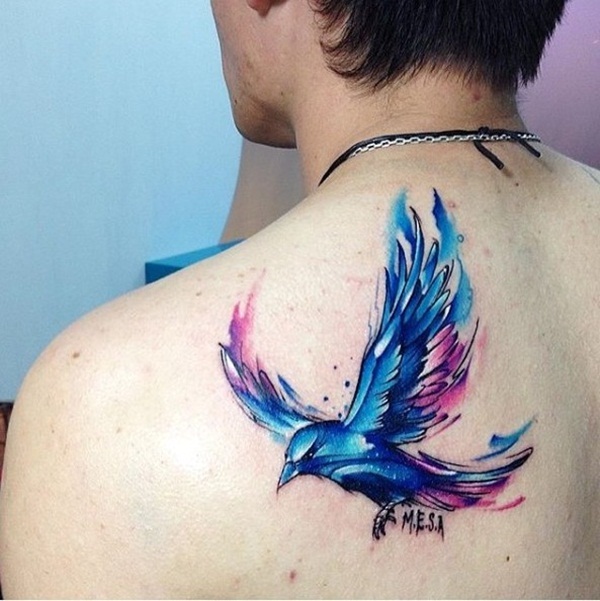 This tattoo looks as if a piece of paper in the shape of a bird was set down and then sprayed with color. You remove the piece of the paper, and there you have an image surrounded by bright colors. It’s a tattoo of course, but a very creative one. You won’t find a more beautiful design than this one; it’s truly stunning. I love the colors involved here they are all very warm. 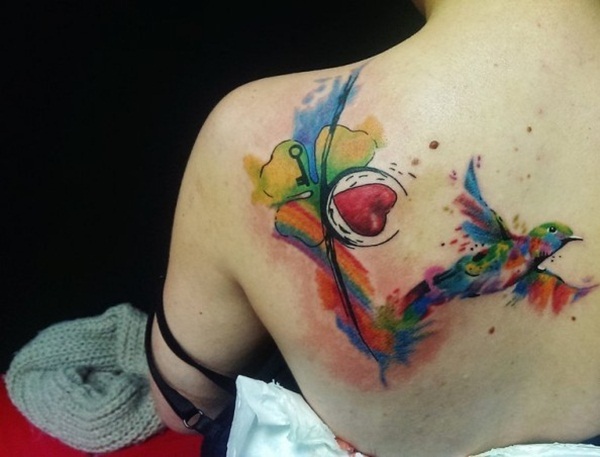 A great watercolor tattoo that is full of color and detail. The colors around the bird are splashes that create floral designs. These birds really pop out because of the contrast between the black and blue colors. These paint splotches are truly unique. 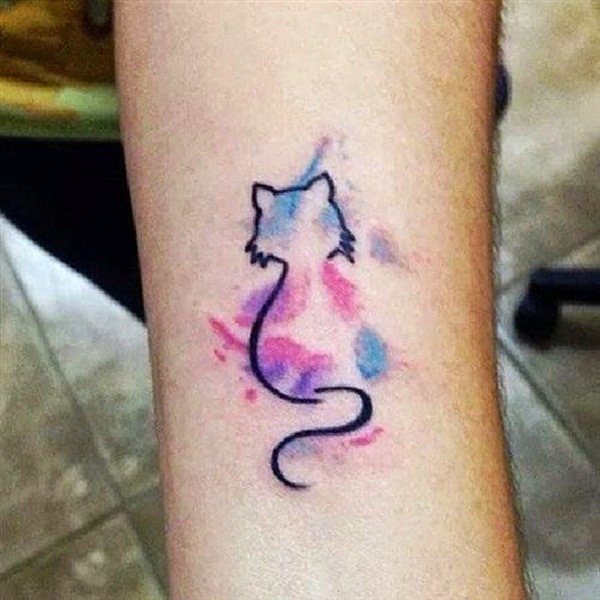 A great kitty outline that makes for a simple tattoo design. 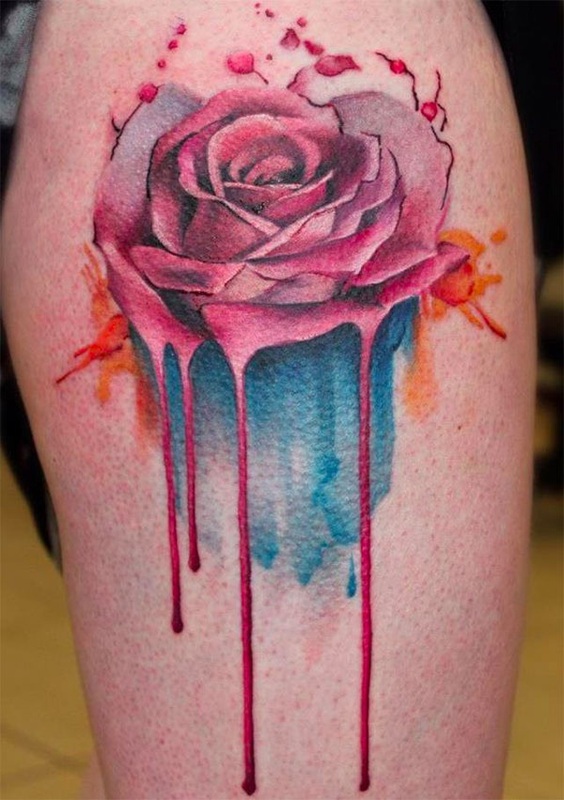 The splashes of color really make the tattoo go from simple to beautiful. A detailed bird design that you are sure to love. 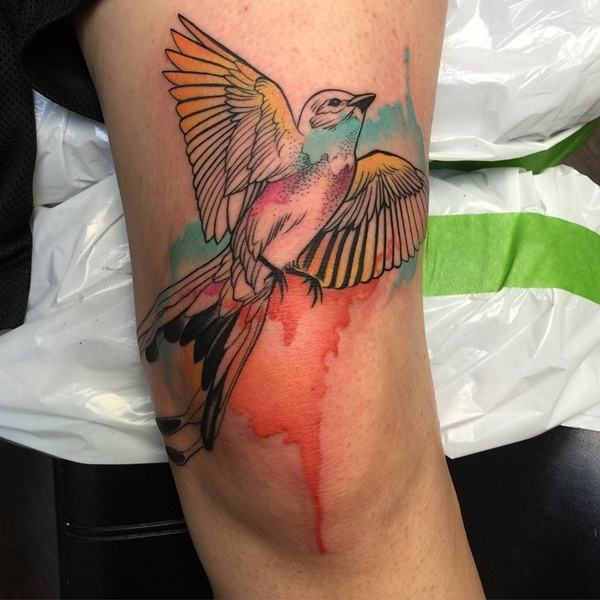 The watercolor splashes are behind the outline of the bird. 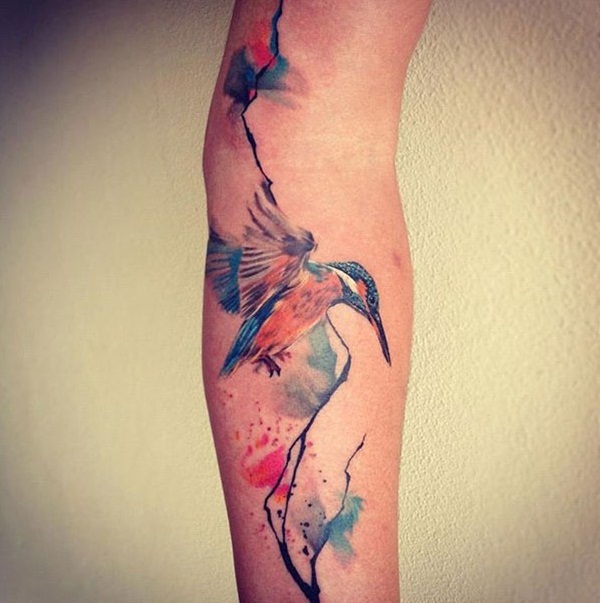 If you love birds, then this might be the tattoo for you. 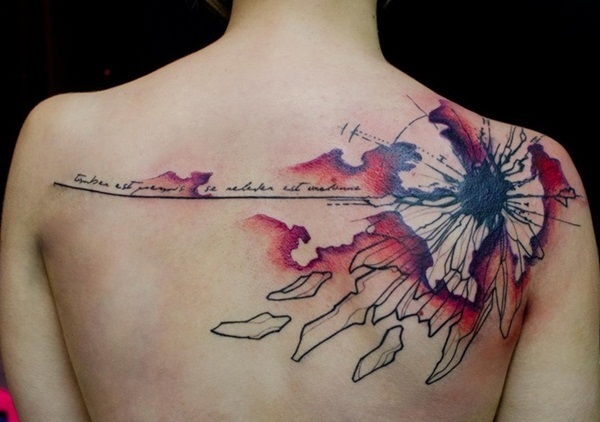 I can’t say enough good things about this tattoo; it’s absolutely stunning. The colors are so bright, and they just make the overall design pop right off the skin. 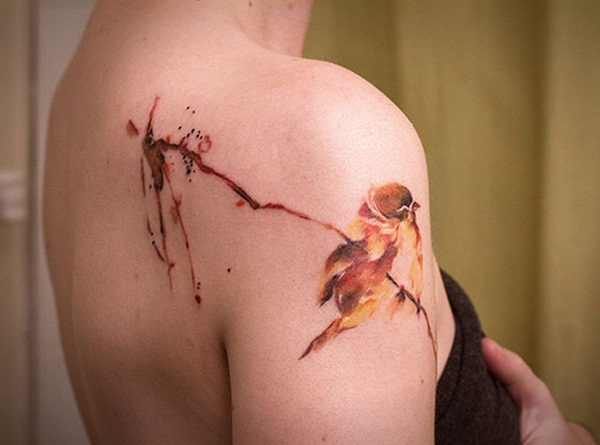 It’s incredible and a great choice for a watercolor tattoo. 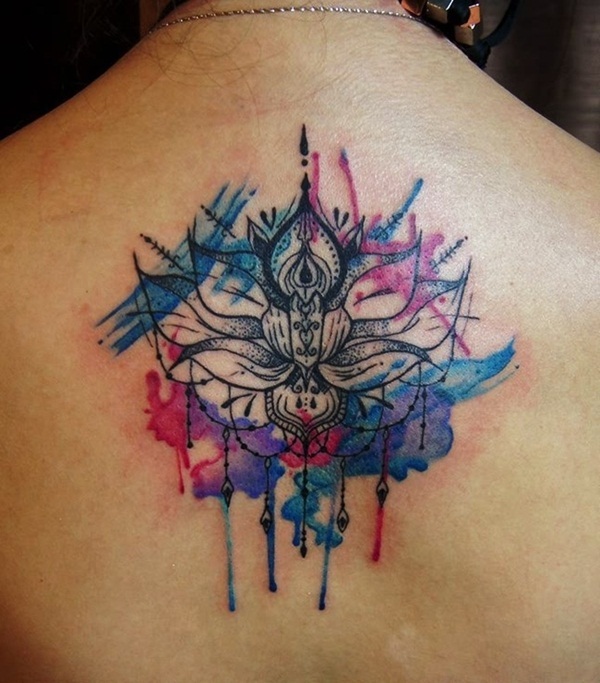 A great tattoo design that is beautiful because of the colors. Add a quote to make it personal. 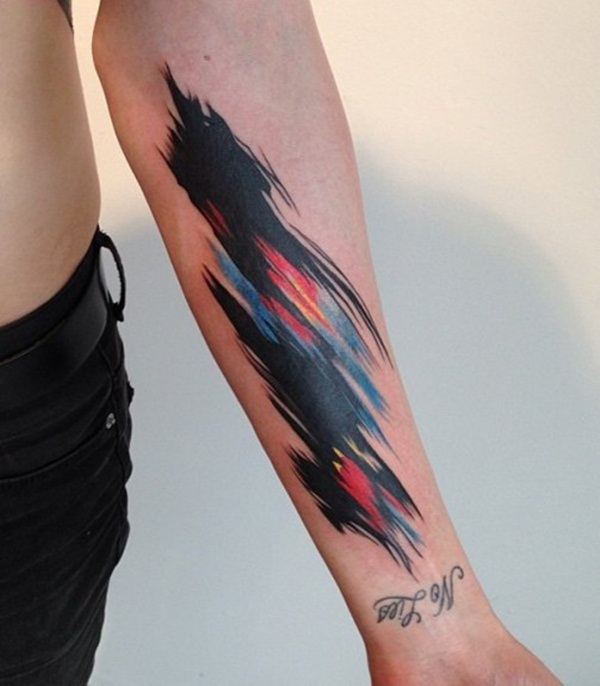 A great tattoo design that consists of brush strokes. The colors are dark and mysterious. There is so much love for the Irish culture behind this tattoo. We have a rainbow of stunning colors; the same colors are also all over the bird. There is a heart, a three leaf clover and a key. They all mean something important to the owner and create a great cultural tattoo. A detailed tattoo design that has many different elements to it. If you are looking for a great look, then you will be very happy with it. It’s like cracks are happening in the seam of the skin. The coloring is pouring out of the skin, and it’s so beautiful. 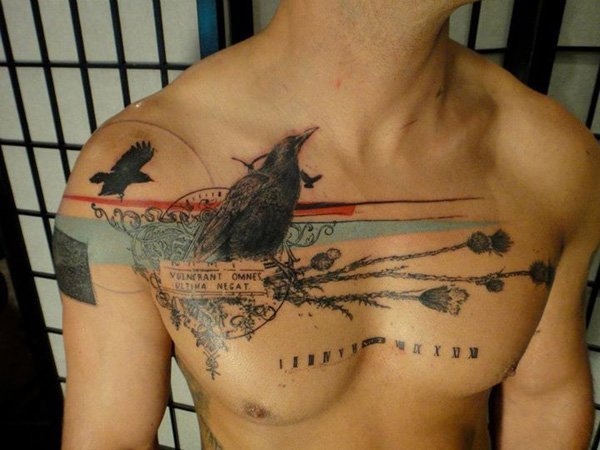 If you are looking for a large tattoo, you won’t find one more badass than this tattoo. It’s incredible because of the painted brush strokes that create the stunning bird. Add it the paint colors, and you get a truly unique look that you are sure to love. 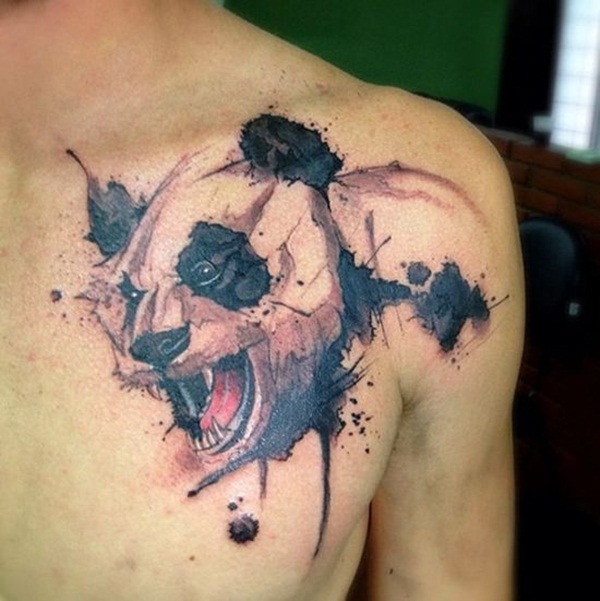 A badass tattoo of a fierce panda bear. It looks like the bear was painted right on the skin, it’s incredible. 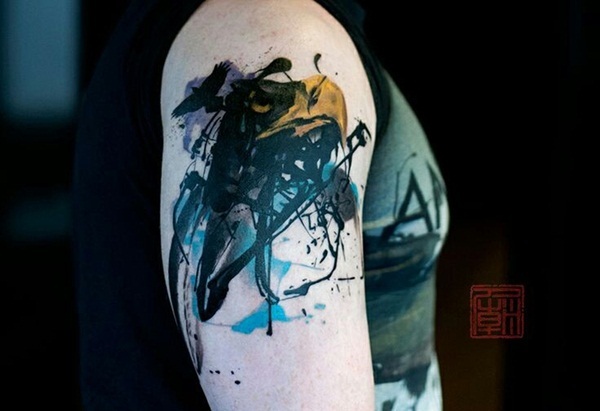 A stunning sleeve design that consists of broad strokes and dark colors. It’s a great idea if you are looking for a more abstract design. If you want to personalize it, add a quote like he did here. These two roosters really know how to fight. One is colored, and one is straight black, giving you the impression that one is good while the other is evil. 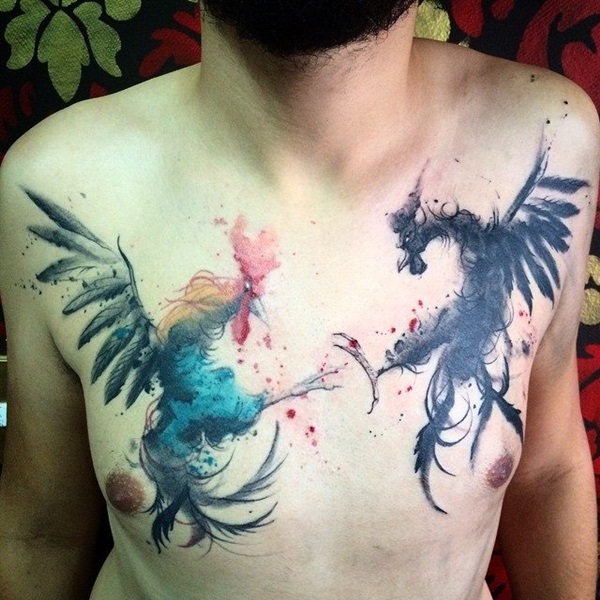 If you are looking for a large tattoo with a fierce look, then go no further than this one. A great colored design that has an old-fashioned watch in it. 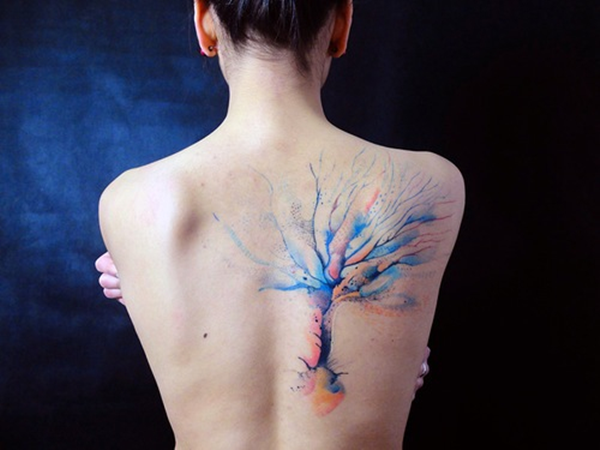 I love the colors involved in these tattoos; they are stunning. This portrait is more abstract then detailed, and there are a lot of colors involved. 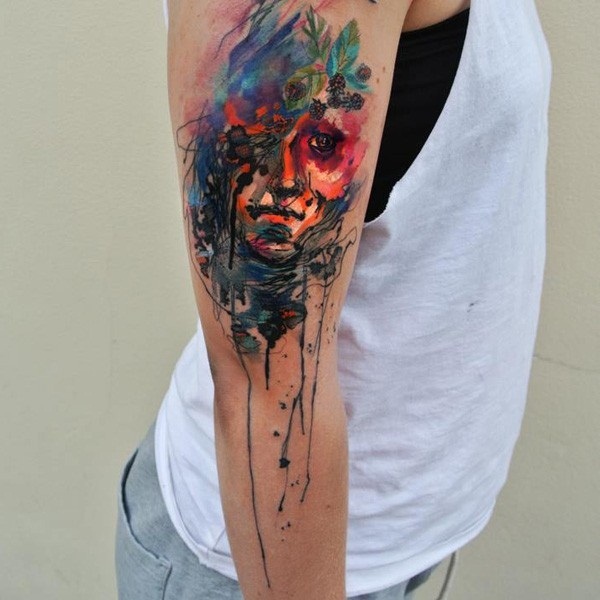 The colors look like a painting, and you can even see the drips going down the arm. You don;t get a more stunning image than this one. 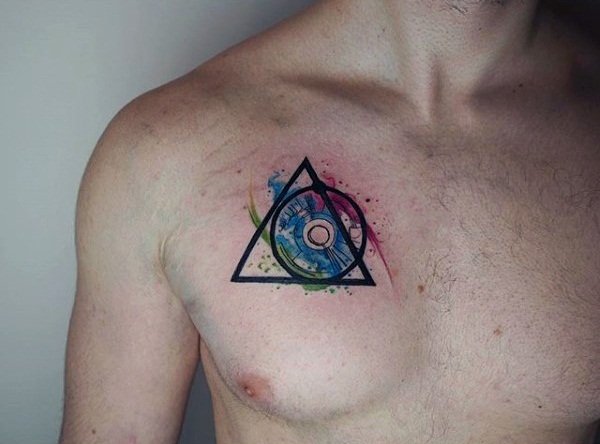 These geometric tattoos always look great with watercolors. Another great example of shapes and colors coming together. 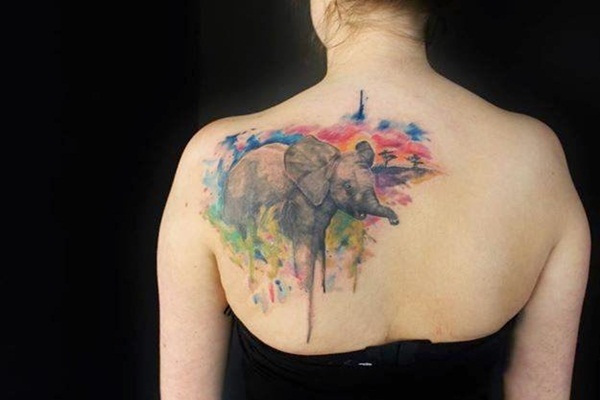 This detailed elephant is surrounded by colors. I love the paint drips that are involved with these colors. 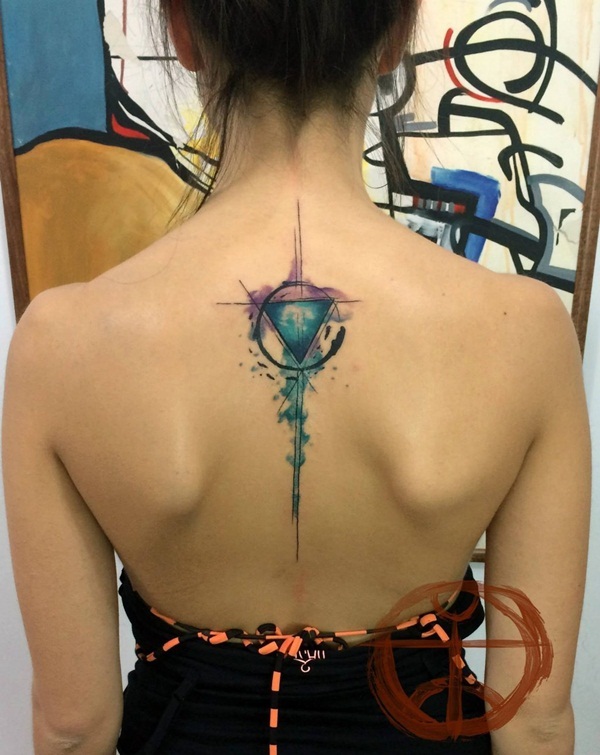 If you are looking for a shoulder tattoo, then you might like this one. 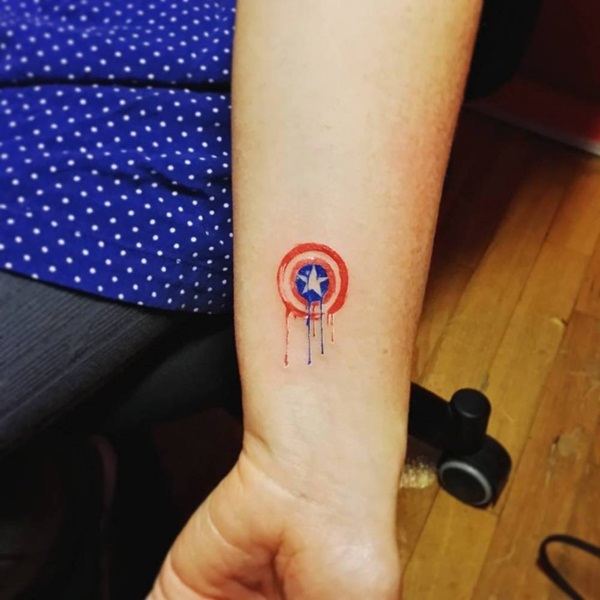 If you have a love for Captain America, then you will love this tattoo. A great tattoo that is small enough to go anywhere. I love the fact that there are small drip lines as if the painting didn’t have time to dry. This rose is covered in pink paint, and it is pouring down the arm. I think the colors are very pretty with this type of design. 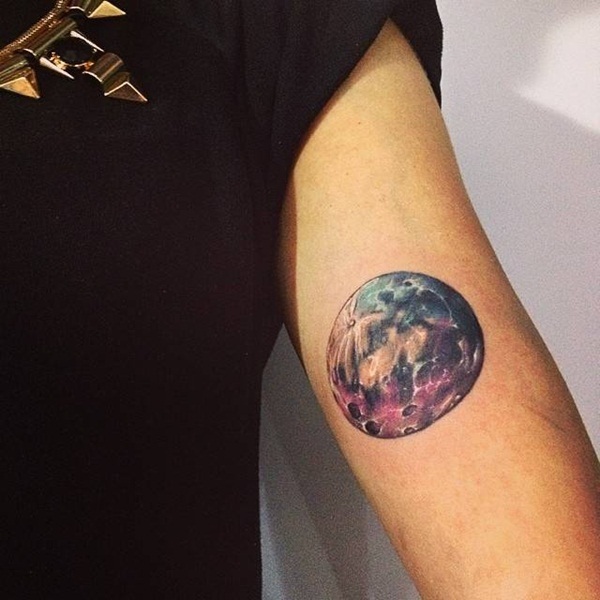 A great tattoo design of a planet with a burst of amazing colors. 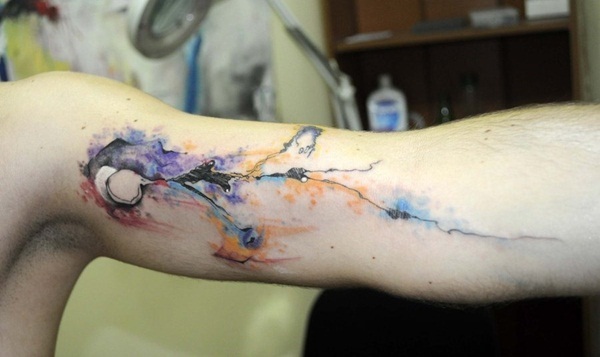 If you love the universe, then you might want a tattoo like this. A unique design that looks great with some bright colors. If you want something beautiful and mysterious, then you are sure to love this design. 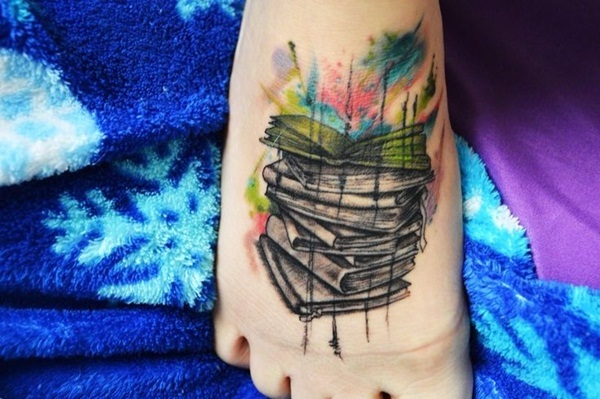 If you have a love for books and are looking for a literary tattoo. The books are left as black and white images, and there is a burst of color behind it. It’s a great tattoo that you can love for many years. A great butterfly design that is full of color. They have a long quote about butterflies on the back as well. 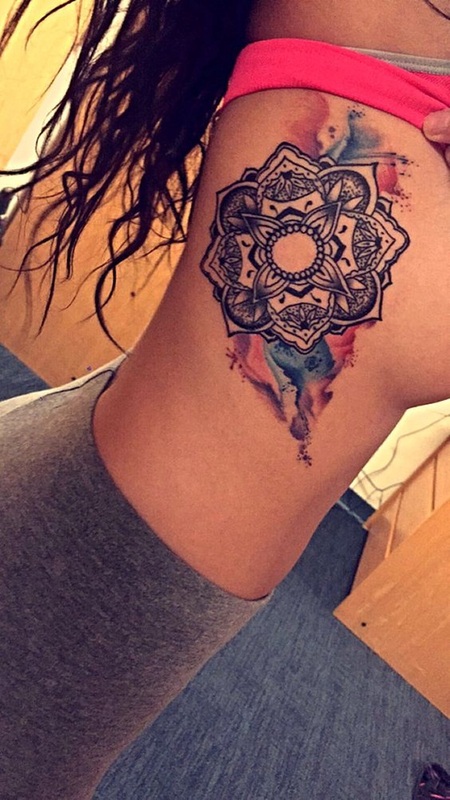 It’s a stunning tattoo design that is rather unique with all the different elements to it. 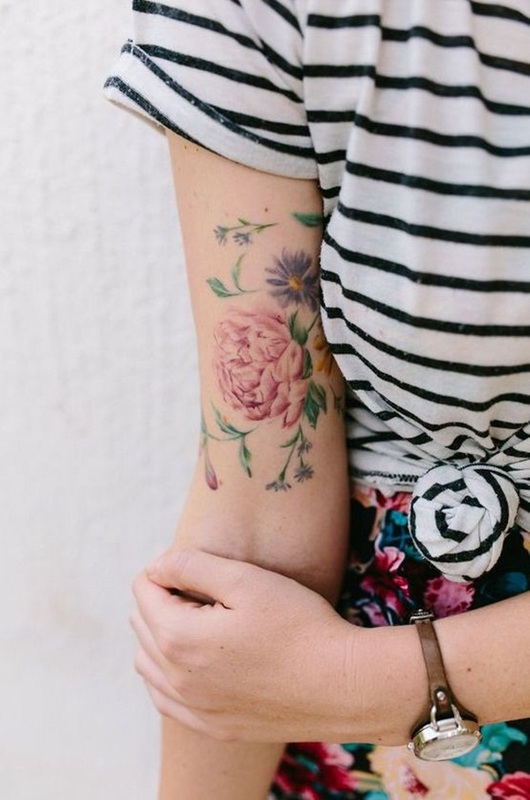 A great tattoo design that is all about the florals. The colors are stunning, and you are sure to love this unique technique that creates such an unusual looking flower. This splash of pink is all about bringing a divine flower to a whole new level. The pink, purple and blue color combination looks really great together. 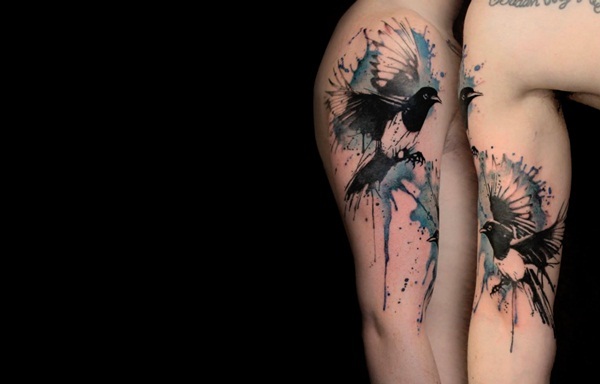 The splashes of paint look incredible as a tattoo design. 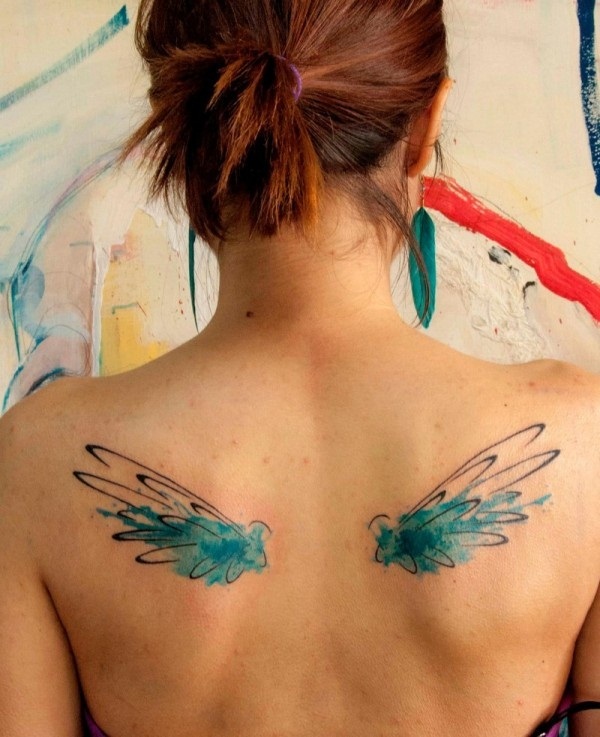 These are some pretty cool looking angel wings; they create such a great tattoo design. The wings are small and unique; they don’t take up a lot of room. 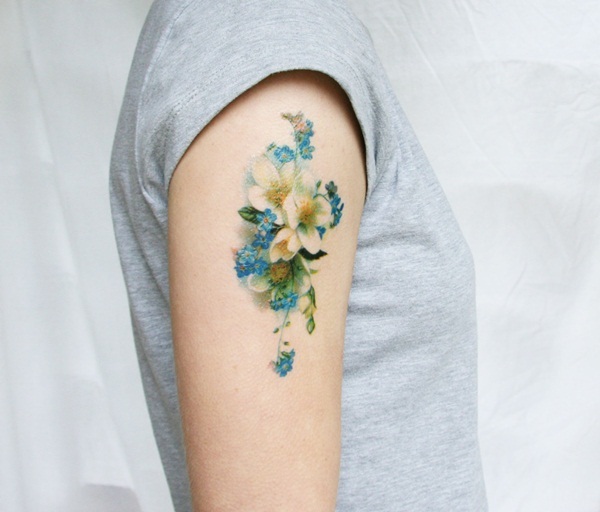 Add a splash of green, and you have a perfect look for a tattoo. 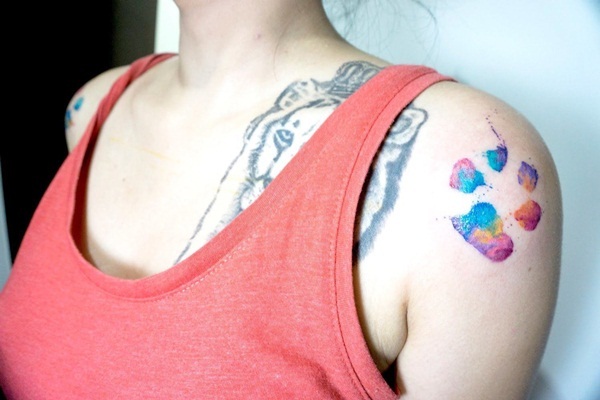 If you have a love for your pet that you want to represent in a tattoo form then why not try out the watercolor tattoo ? It’s so unique as if your pet stepped in paint and you can’t get better colors than these.